A misaligned jaw or bad bite (also referred to as malocclusion) can cause a number of other oral health issues. You may recognise a misaligned jaw or bad bite as one of it’s other names, including crowded teeth, cross bite, over bite, under bite and open bite. In an ideal mouth, your teeth would easily fit. There would be no crowding or space issues. In addition, the teeth in the upper jawline would just overlap with those in the lower jawline, so the molars fit snugly into the grooves of the molar directly above or below. None of your teeth should be rotated or twisted; as this misalignment will inhibit your teeth from performing their vital functions. To diagnose a malocclusion of the teeth, a typical dental exam will be conducted. We will inspect your mouth and teeth, sometimes performing a dental x-ray to determine whether the teeth are aligned. If we find that there is an issue, then we will classify this by both severity and type. 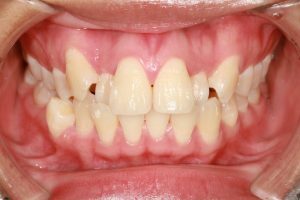 Plus, preventing this disorder from occurring can be difficult; this is because most cases of malocclusion are hereditary. Why Treat a Misaligned Jaw or Bad Bite? There are a number of reasons why a Misalignment of the jaw should be tended to sooner rather than later. As far as treatment is concerned, the earlier that the issue is dealt with, the better the results will be. Alignment of upper teeth is needed to prevent the cheeks and lips from being bitten, while alignment of lower teeth is needed to protect the tongue from being bitten. While not life threatening, this condition can become a painful inconvenience for your dental wellbeing. It can also lead to a number of long-term problems such as fractured teeth due to a misaligned jaw. It also may affect your ability to wear veneers, crowns or implants, should you consider these for cosmetic purposes.